Tummy tucks are not just for women. Major weight loss and aging may cause the men’s abdominal wall to lose skin elasticity and tone. As a result, otherwise healthy men are not able to achieve a flat, defined abdomen through proper nutrition and exercise.If you’re a man who has undergone significant weight loss, it may be time to consider a tummy tuck. When to Choose a Tummy Tuck for men? A male tummy tuck, also known as abdominoplasty, can flatten the tummy by removing excess skin and fat from the midsection. It is a very individualized procedure. For men with excess fat in the love handle area simple male liposuction is all that is needed. If there is some minimal saggy skin skin then mini or modified tummy tuck is needed. Standard tummy tuck is used when there there is more loose skin in the front of the abdomen and some muscle repair is required. For those who had massive weight loss a body loft is needed to give satisfactory results. Generally, men are less likely than women to require diastasis (muscle) repair. Tightening the rectus abdominus muscles has a feminizing effect because it narrows the waist, a result that male patients usually want to avoid. However, diastasis repair may be necessary in some cases, in addition to removal of excess skin and fat. The best candidates for male tummy tuck surgery are healthy and have clear expectations. We can determine if you are a good candidate during a personal consultation. Be prepared to discuss factors such as your medical history and cosmetic goals. A tummy tuck requires general anesthesia or local anesthesia combined with intravenous sedation. Once you’re comfortable, we will begin by making an incision just above the pubic area that extends from hip-to-hip. Another incision is sometimes made around the navel. When at all possible, we plan incisions so they can be hidden beneath undergarments. Next, we will reshape or remove excess fat. In some cases abdominal liposuction is performed along with a tummy tuck to target stubborn fat. If necessary, we repair stretched or separated abdominal muscles. Your skin will then be re-draped over your newly contoured abdomen and excess skin will be trimmed away. All incisions will be secured with sutures and temporary surgical drains may also be placed to collect fluid buildup. Expect some moderate discomfort and post-surgical swelling and bruising. We will provide you with pain medication and instructions for postoperative care. You will need to wear an elastic compression garment around your abdomen for several weeks to expedite the healing process. Most men will be able to return to office work after 10 days. Stitches are generally removed within 1-2 weeks of surgery. At this point, most patients feel comfortable returning to work and light physical activity. Exercise and heavy lifting should be avoided for a least a month until your healing has progressed. It is important to note that permanent scarring is inevitable with a tummy tuck. Your scars will initially appear pigmented and raised. They will gradually fade and flatten over the course of 12-18 months. All surgical procedures, including male tummy tuck surgery, present a degree of risk and uncertainty. These risks will be discussed in depth during your consultation. Though rare, risks may include unfavorable scarring, bleeding, infection, skin loss, changes in skin sensation, adverse reaction to anesthesia, skin discoloration and unsatisfactory results. Are you interested in learning more about male tummy tuck surgery? Contact us to schedule a consultation. During your consultation, you will have the opportunity to review our gallery of tummy tuck patient photos and discuss details such as your total cost and expected recovery time. 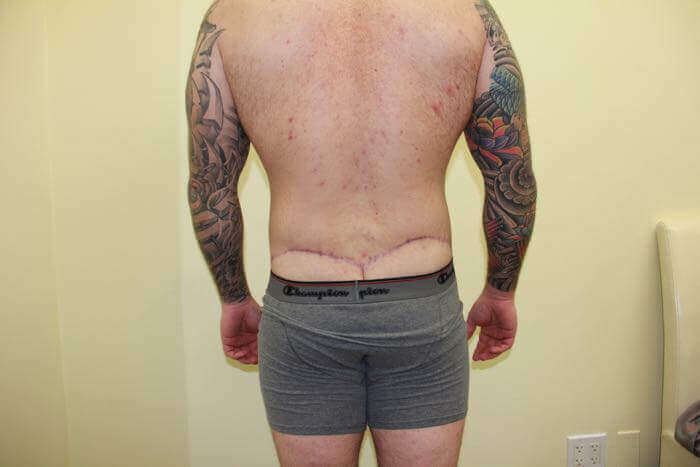 Tjis patient has weight loss and had excess skin in front of his abdomen and back. 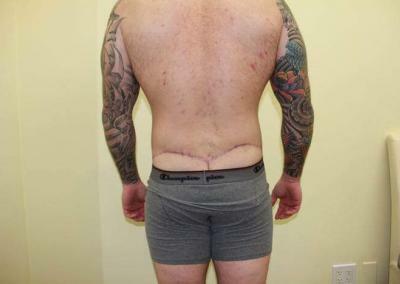 He underwent excision of excess skin from the front and back of the abdomen. Hi recovery was uneventful.